International Journal of Research in Health Sciences,2018,6,3,18-24. 1Associate Professor Pathology 2Ex-Demonstrator Pathology 3Associate Professor Pathology 4Professor Medicine, Government Medical College Hospital, Chandigarh, INDIA. Introduction: Extrapulmonary tuberculosis although common, can present with variable clinical presentation intricating the diagnosis. The prognosis is usually poor in such cases. Symptoms can be non-specific like pyrexia of unknown origin(PUO), bodyaches, loss of weight/loss of appetite, bleeding diathesis, lymphadenopathy, hepatosplenomegaly and rarely haematological abnormalities like anemia, leucocytosis/leucopenia, pancytopenia, leukemoid reaction in peripheral blood smears alongwith various other bone marrow findings. In such cases, sometimes only bone marrow examination helps in reaching the accurate diagnosis, which is confirmed by reviewing the patients with extrapulmonary tuberculosis in our case series. Materials and Methods: We hereby report the case series of 45 patients who underwent bone marrow examination(BME) from the year2004 to 2015 in tertiary care hospital and were diagnosed with granulomatous reaction consistent with tuberculosis on bone marrow examination. Spectrum of non-specific clinical presentations and haematological abnormalities were reviewed. Result: Confirmatory diagnosis i.e. 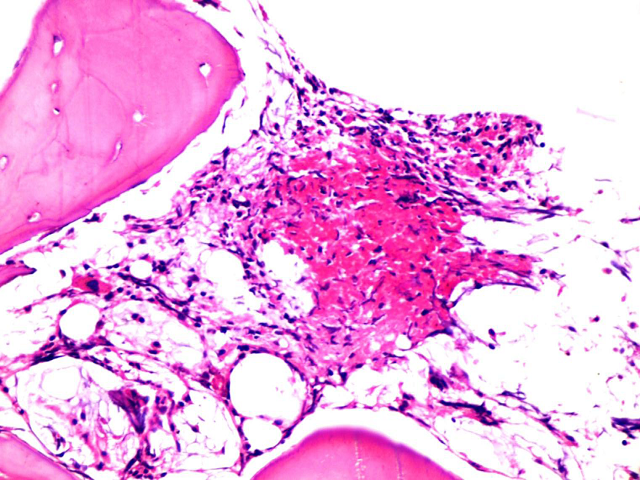 granulomatous reaction in bone marrow consistent with tuberculosis was made in all the cases. Bone marrow aspirate of all the cases were also sent for isolation of Mycobacterium by culture in Lowenstein-jensen medium. Conclusion: This study highlights the significance of non-specific but numerous important clinical pointers as well as haematological parameters in extra-pulmonary tuberculosis particularly involving bone marrow.